To achieve our goal of carbon neutrality by 2020, Hotchkiss has made green infrastructure a top priority. While we’ve increased our building square footage by one-third in the past few years, overall energy use on campus has decreased by nearly 20 percent. 35 percent of our electricity comes from wind power. 95 percent of our heat and hot water comes from a wood chip-powered central heating facility, which equals about 40 percent of our overall carbon footprint. 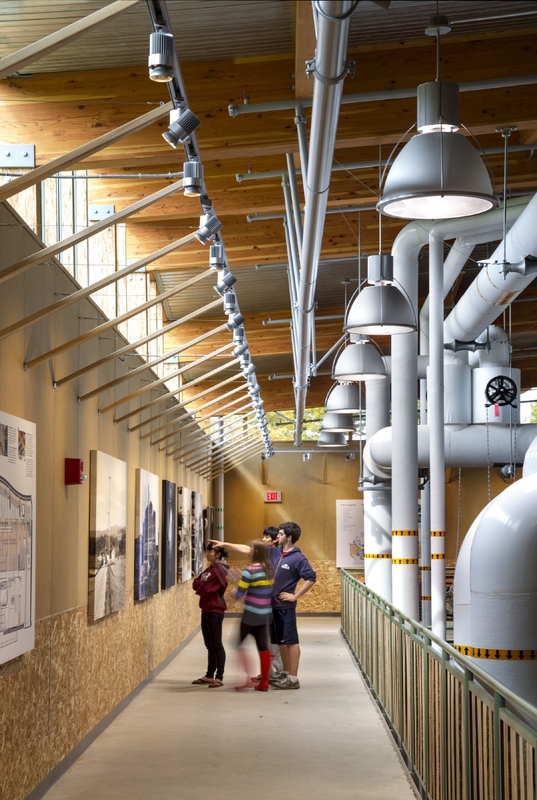 Many of Hotchkiss’s state-of-the-art facilities reflect our commitment to sustainability. Completed in 2012, Hotchkiss’s central heating facility is one of only three LEED-certified power plants in the country. The plant supplies 95 of the energy used for heat and hot water on campus. The most obvious green feature of the building is the undulating green roof, which adds aesthetic value and absorbs about 50 percent of rainfall water to protect the surrounding wetlands from erosion and pollution. Constructed wetlands, called bioswales and rain gardens, have enhanced the ecosystem at the site as part of the landscape design. Inside the building, curved, laminated wood beams from certified forests support the green roof at lower cost than steel trusses. Completed in 2005, the LEED-certified music wing utilizes water-efficient landscaping to curb water usage by 30 percent. Twenty percent of the building materials were manufactured locally, and half of those materials were also harvested locally. Flinn and Edelman dormitories were the first buildings on campus to receive gold LEED certification. A state-of-the-art air flow system guarantees excellent air quality while minimizing heat loss. Each room has individual temperature control and radiant heat. Redlich Hall was opened in 2016, also as a LEED certified building. The original Monahan Hall was designed by Delano and Aldrich in 1937 and served as the School's gymnasium until the Forrest E. Mars Jr. Athletic Center was built in 2002. With the construction of the new athletic facilities, the School decided to preserve the vintage structure of Monahan while repurposing it into a LEED gold-certified multi-use facility, with an event space and kitchen (ground floor), offices for Alumni & Development and Communications (first floor), two residential apartments for visiting faculty, and space for the Center for Global Understanding and Independent Thinking (second floor). The building uses 100 percent green power.